I'm really enjoying making things from the Pennsylvania Dutch cookbooks and these little German egg pancakes are no exception. They were easy and quite hearty from all the eggs in them. They taste almost like a crepe - just a thick and fluffy one. These pancakes were perfect topped with strawberries (though I think any berry or mix of berries would work) and a touch of real maple syrup. The cookbook also suggested molasses as a topping and I also think a jam smeared on them would be good. I love making breakfasts like these on the weekend (plus most people know i have a bit of a pancake obsession). It's such a wonderful treat to have a relaxing morning where you can actually sit, eat, and enjoy a nice meal that isn't rushed while you are trying to get to work (or at your desk when you get to work like mine usually is). We ate these before we went for a hike at a nearby park to look for spring wildflowers last Saturday. These pancakes kept us full for our walk where we saw a lot of spring wildflowers, birds, and a couple of turtles. Carefully crack and separate the eggs placing the yolks in one medium bowl and the whites in another medium bowl. Whisk the egg whites until they form stiff peaks (use a hand mixer, if desired). Set aside. Whisk the egg yolks until they lighten. Whisk in the flour, milk, and salt until well-combined. Then fold in the egg whites. Heat a griddle until hot and grease with some butter. Add the batter 1/4 cup at a time and cook until the pancakes are golden and begin to bubble. Flip and continue to cook until golden. Repeat until all the batter is used. Serve hot with your preferred toppings. Your pancakes looks lovely. And serving it with fresh strawberries looks really good! I love pancakes too. These look yummy! I like the recipes for pancakes when you beat the whites, the pancakes get nice and fluffy. Hi Amy, we love to hike too, one of my favorite things is to get up early, hike and then come home and have a nice relaxing breakfast. These sound delicious, great recipe! I love Pennsylvania Dutch cooking. I think, I am going to check out those cookbooks from the area and hopefully make the pancakes. These pancakes look so fluffy and soft. I love them without additions of leavening agents. OK now I want pancakes and it's 2 a.m!! These look perfect! Ooh, these look wonderful! 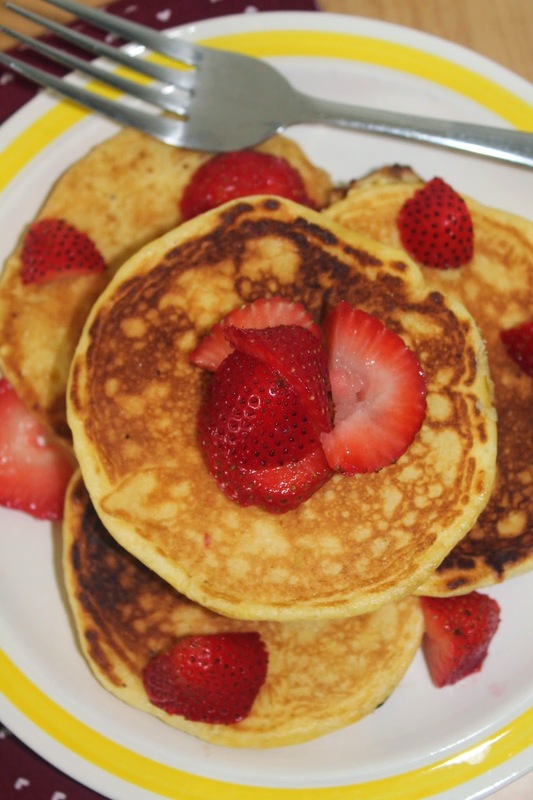 It's breakfast time here right now, wish I had a few of these pancakes to eat! I have a pancakes obsession too! I don't think any weekend would be complete without pancakes! I've never made a batter with so many eggs. Must try it. Can always use the extra protein! Gosh, I'll bet these are nice and light! I'll never turn down a pancake -- never! You've got me in the mood now -- I need to make these! Thanks! Whoa! THat is a lot of eggs for pancakes! I feel like that might make them almost custardy! Pancakes any which way are a good thing! And this is like pancakes and eggs! I probably fall into the pancake obsessed crowd too. I am pretty fond of different French toast recipes also. I agree Holy Moly this is a lot of eggs in ratio to flour. Yet they look thicker than I would imagine they would me. So that tells me they have to be fluffy airy babies. Yum! Yum! These sound delicious! And I could definitely go for some right now. 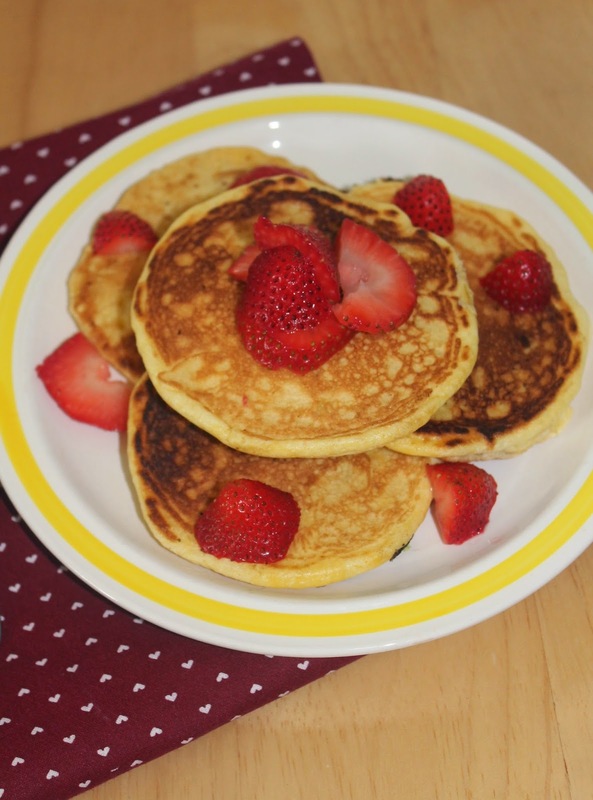 I love pancakes for a weekend breakfast! These look fantastic with the strawberries on top. These do look so tempting - I love eggy pancakes the best. Thanks for a great recipe! I bet these are fluffy pancakes. The recipe sounds delicious. Thanks for sharing over on Foodie Friday! Pancakes are the best! PINNED!